At this time of year, black ice or hard packed snow make horrible conditions to go out in. Even though we expect at any minute to slip, slide or wallop down on our backsides, when we do, our insides cartwheel. This is how I felt, when I first lost my sight and had to go ‘out there’, alone, says Joanne Roberts. Every instinct would raise my tension levels to red alert and I’d have to bully myself to open the front door. This was certainly the case, before, during and after, the near-accident I describe in the prologue to my new eBook, co-written with Uska, 'Confessions of a Guide Dog'. I was 37 and decided, after this, I’d had enough. To keep myself and everyone around me safe, I needed help. But the notion made me recoil inside. What about my freedom and independence? I’d almost given up on ever feeling any self-respect again until the day I knocked over a model Guide Dog, one of those with a slot in its head. That was when I had a “light bulb” moment. As a life-long dog fanatic, the idea should’ve occurred to me years earlier. Should I, could I, have a guide dog? Sadly not all blind people can. Maybe their serious health or immobility issues conflict with a dog owner’s lifestyle. Sometimes, the blind person doesn’t want the extra responsibility, or doesn’t like dogs. Luckily none of this was me. Within weeks, I joined hundreds of other blind people on a waiting list for the right dog to be born, trained and matched with me. The latter depends on the dogs size, breed, skills and character. (Not forgetting the requests and special requirements of the potential owner.) It became a family joke to guess what type of dog Guide Dogs UK would pair me with. I’m still wondering what on Earth the charity was thinking when it came up with Uska. My husband thinks it’s really funny that I got a dog who would take me to the local Tesco Express, with a pair of knickers (mine and clean), hanging from his mouth! And of course he thinks only I would end up with the greediest Labrador in history. However, I admit, from day one, it was love at first lick. “It was a summer morning when Mr Nick walked me up the drive of my new home. I don’t mind telling you, I was a little daunted. As Mr Nick wasn’t I didn’t let it worry me too much. I padded alongside him, very smart and proud of my new harness. Negotiating my way across the large gravel stones, leading up to a strange front door, I was ready for anything as he reached for the bell. Before his finger touched the button, the door flung open. And there she stood, my mam, a vision in odd socks. Uska’s practical support in my life is irreplaceable. Not only has it taken the pressure off my husband and our family, it’s made going out there a pleasure again, a bit like having spiked shoes in freezing weather. But like so many dog loving owners, I’ve also had, and still have, a best friend, one that makes me laugh every day. “…we headed for the bread and cakes and stuff. Being new to this guiding game, Mam soon got engrossed with the cream cake lady while I got nose to cherry with a black forest gateau. It was like she forgot everything we’d been taught, and I couldn’t remember the things I’d learnt. Closer and closer I gently tugged, so she hardly felt the harness pull at her fingers. “’Ah!’ said my pesky mind-pup, “Maybe you can get closer…go o-o-on, do it!” So, closer I sneaked. Before I knew what was happening, I bit into the cake box and pulled it off a pile of them, stacked dog high, in a low down fridge unit. The more I licked, the more the cream squirted out, and the harder it became to stop. I was so delirious with happiness when I reached the first cherry, I ignored the ominous voice that boomed down the aisle. I just carried on licking until I heard it a second time. USKA!” said a voice like Mam’s, but Mam if she was a trombone. The yapping mind-pup disappeared, leaving an echo, “Uh-Oh!” it sounded like. Who wouldn’t want to share stories like this? I especially did, so I could help raise funds for more dogs like my boy, who’s just had his 9th birthday and grows more precious with each grey hair. So I wrote ‘Confessions of a Guide Dog’, giving Uska’s version of our training, his little misdemeanours, my mistakes and our gaffs. Everything takes place in our first year as partners, because it really was a big one. My dog says what he thought about everything, from my wedding, a black and white one to match his fur and harness, to my life saving, organ transplant at the end of the year. 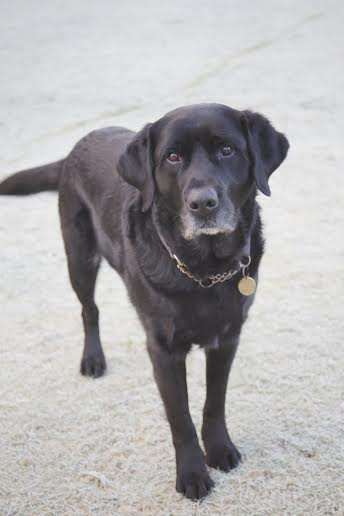 Joanne Roberts is Uska’s owner and ‘Confessions of a Guide Dog’ is a fun way to explore their first year together and their version of training, his misdemeanors, Joanne’s mistakes and gaffs (her words). 25% of each eBook sold will be donated to the Guide Dogs for the Blind. Joanne hopes enough will be raised to sponsor another guide dog.